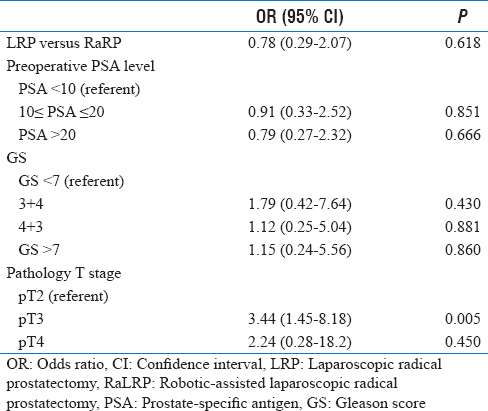 Objective: To compare pathological and oncological outcomes between robotic-assisted laparoscopic radical prostatectomy (RaLRP) and laparoscopic radical prostatectomy (LRP) among high-risk prostate cancer patient in a tertiary center in Taiwan. Materials and methods: From November 2003 to October 2013, 129 high-risk prostate cancer patients receiving minimally-invasive radical prostatectomy were included. The Kaplan–Meier analysis was used for measuring biochemical recurrence-free survival (BFS). Multivariate logistic regression models and Cox proportional hazards regression models were used to determine predictors of positive surgical margin and BFS. Results: Among the 129 high-risk prostate cancer patients included, 80 (62%) patients received LRP and 49 (38%) patients received RaLRP. 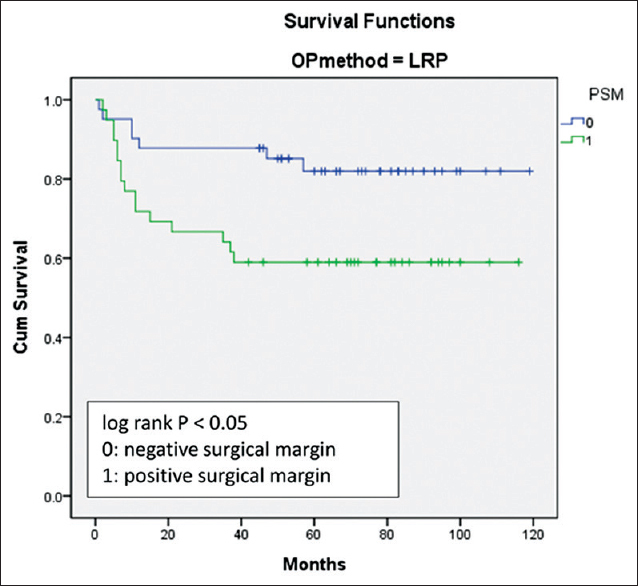 There was no significant difference of positive surgical margin and biochemical recurrence rate between RaLRP and LRP group (P = 0.802 and 0.292). Higher pathological T stage predicted an increased likelihood of positive margins (OR = 3.44, 95% CI [1.45, 8.18], P = 0.005). Higher initial PSA level (HR = 2.88, 95% CI [1.04, 7.94], P = 0.041) and positive surgical margin (HR = 2.55, 95% CI [1.20, 5.44], P = 0.015) were poor prognostic factors for BFS. Conclusion: RaLRP can be considered among high-risk prostate cancer in Asian people with comparable oncological outcomes to LRP. Higher pathological T stage was associated with increased likelihood of positive margins, patients with higher iPSA level and positive surgical margin had worsen biochemical recurrence-free survival. Prostate cancer was one of the most common cancers among men in Western countries, with incidence rate >200/100,000 persons per year. Although Asian people have lower incidence rate, they have higher proportions with advanced prostate cancer compared with Western populations. Although more localized prostate cancers were diagnosed by the widespread use of prostate-specific antigen (PSA) screening in recent years, still about 20%–35% of the patients had nonmetastatic high-risk disease. There was no consensus about the best choice of treatment among men with high-risk prostate cancer, but more literatures showed favorable outcomes for those treated with radical prostatectomy (RP)., One large study comparing RP with external-beam radiation or androgen deprivation therapy (ADT) monotherapy among high-risk prostate cancer patients, which included >7000 patients in the Cancer of the Prostate Strategic Urologic Research Endeavor database, showed a lower mortality rate in the RP group compared with radiation therapy or androgen deprivation monotherapy groups. Compared with open RP, studies showed that patients treated with laparoscopic RP (LRP) have comparable oncological outcomes., In recent years, robotic-assisted LRP (RaLRP) is gaining its popularity due to decreased perioperative blood loss and equivalent oncological outcomes compared with open RP.,, However, few literatures compared outcomes between LRP and RaLRP in Asian patients with high-risk prostate cancer. Therefore, we investigate the pathological findings and oncological outcomes of high-risk prostate cancer patients between LRP and RaLRP in our hospital. Patients with high-risk prostate cancer, who were treated with minimally invasive RP, either LRP or RaLRP, from November 2003 to October 2013 at National Taiwan University Hospital were included in the study. High-risk prostate cancer was defined as clinical stage ≥T2c, biopsy Gleason 8–10, or serum PSA levels >20 ng/mL. Exclusion criteria were those with metastatic prostate cancer diagnosed through images at presentation and patients with clinical T4 disease before the surgery. After the operation, all patients received regular follow-up every 3 months in the first 2 years and every 6 months thereafter. The primary outcomes were positive margin rates and biochemical recurrence-free survivals (BFSs) between LRP and RaLRP groups; the secondary outcomes were to determine prognostic factors for positive surgical margin and biochemical recurrence among high-risk prostate cancer patients. Oncological outcomes were measured by surgical margin status and biochemical BFS. Biochemical recurrence was defined as PSA ≥0.2 ng/mL in two consecutive measurements or receiving any salvage treatments. Patients' clinical data and pathological outcomes were compared with Student's t-test and Chi-squared test. The Kaplan–Meier method and log-rank test were used for measuring biochemical BFS. Multivariate logistic regression models and Cox proportional hazards regression models were used to determine predictors of positive surgical margin and biochemical BFS. All analyses were performed with Statistical Package for the Social Sciences software (SPSS 22th, Chicago, IL, USA). Baseline clinical information for patients is shown in [Table 1]. A total of 329 patients received minimally invasive RP from 2003 to 2013; 129 (39.2%) patients were identified as high-risk prostate cancer. Among these patients, 80 (62%) patients were treated with LRP, while 49 (38%) patients underwent RaLRP. The median follow-up duration was 78 months and 14 months for LRP and RaLRP groups, respectively. There were no differences of median age (P = 0.125), initial PSA (iPSA) level (P = 0.146), and biopsy Gleason's score (P = 0.146) between LRP and RaLRP groups. However, there were more locally advanced prostate cancer patients in RaLRP group (cT3, n = 16, 33%) than in LRP group (cT3, n = 10, 12%) (P < 0.01). The operation time between RaLRP and LRP group was not statistically different (RaLRP vs. LRP, 372 min vs. 319 mL, P = 0.06) [Table 2]. When RaLRP group patients were stratified into two different groups (Group I: RaLRP in the first 6 months and Group II: RaLRP after the first 6 months), it showed a trend of decreased operation time comparing RaLRP group II with RaLRP group I (Group I vs. Group II, 391 min vs. 351 min, P = 0.124) [Table 3] although not statistically significant. No difference of estimated blood loss was noted between RaLRP and LRP group (RaLRP vs. LRP, 337 mL vs. 407 mL, P = 0.081). RaLRP group II showed a trend of fewer estimated blood loss compared with RaLRP group I (Group I vs. Group II, 430 mL vs. 279 mL, P = 0.081) although no statistically significant. The comparison of the operation time and the estimated blood loss between Group I and Group II in RaLRP patients showed a surgical learning curve for improving perioperative outcomes at our institute. There were more pathological T2 prostate cancer patients in the RaLRP group (n = 35, 71%, P < 0.05) but more pT3 prostate cancer (n = 45, 56%) and more lymph node involvement (n = 10, 13%) in the LRP group (P < 0.05) [Table 2]. There were four patients having pathological upstaging shift from clinical T3 disease to pathological T4 disease with either bladder or rectal wall invasion in the LRP group. The lymph node dissection number in LRP group (9 ± 5.2) was more than RaLRP group (5 ± 2.9). However, lymph node dissection number was not a prognostic factor for better biochemical BFSs in the univariate analysis (dissection number >10 vs. dissection number ≤10, hazard ratio [HR]: 0.982, P = 0.963, table not shown). 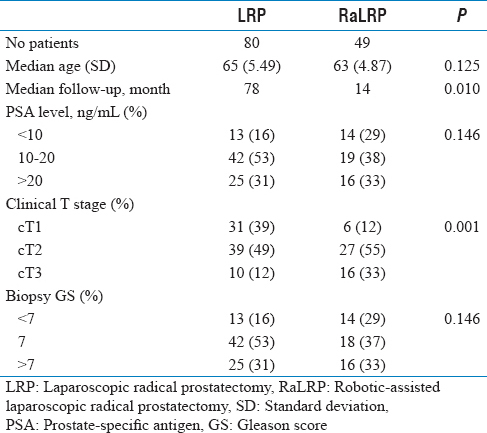 No statistically significant difference of positive surgical margin (LRP vs. RaLRP, 49% vs. 51%, P = 0.802) and biochemical recurrences (LRP vs. RaLRP, 29% vs. 20%, P = 0.292) was noted between LRP group and RaLRP group. The Kaplan–Meier analysis also showed no significant difference of BFS between groups (log-rank, P = 0.705), [Figure 1]. BFS for LRP compared with RaLRP was 80% versus 77.9% at 12 months and 78.8% versus 77.9% at 18 months. Multivariate logistic regression model showed no effect on positive surgical margin status between different surgical approaches, pathological Gleason's score, or iPSA level [Table 4], although higher pathological T stage appeared to predict an increased likelihood of positive margins (pT3 vs. pT2, odds ratio = 3.44, 95% confidence interval [CI]: [1.45, 8.18], P = 0.005). After being stratified by a positive surgical margin in RaLRP group, patients with PSM were more likely to have biochemical recurrence (log rank, P < 0.05) [Figure 2]. Similar result was also noted in LRP group (log rank, P < 0.05) [Figure 3]. Multivariate Cox regression model for prognostic factors for biochemical recurrence was shown in [Table 5]. It did not appear to be any difference in the probability of recurrence between different iPSA level, pathology Gleason's score, and pathological T stage. However, positive surgical margin predicted an increased risk of biochemical recurrence (HR = 2.55, 95% CI: [1.20, 5.44], P = 0.015). In Asian countries, the incidence of prostate cancer is lower than in Western countries; however, the incidence of advanced prostate cancer is much higher. This may be due to multiple genetic and environmental factors such as Western diet or lower exposure to PSA screening in Asian individuals. Thus, the most appropriate methods to approach patients with high-risk prostate cancer in Asian countries might be different from the Western countries. This is the first study comparing RaLRP with LRP among high-risk prostate cancer patients in Taiwan, where the prostate cancer prevalence was relatively lower than Western countries. Punnen et al. reported that a single-center study with 410 high-risk prostate cancer patients showing RaLRP had equivalent oncological outcomes comparing with open RP. 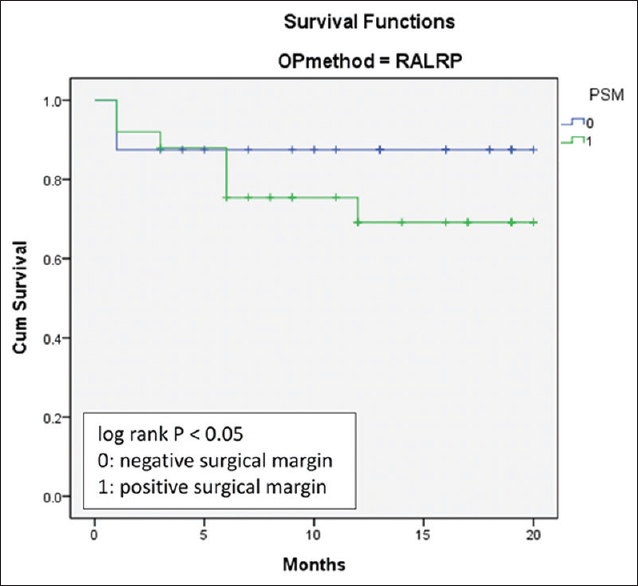 Another study with 913 high-risk prostate cancer patients showed that RaLRP had similar oncological outcomes and surgical margin status compared with LRP and open RP. In our study, RaLRP and LRP groups were equivalent on the demographics of median age, iPSA, and biopsy Gleason's score. More locally advanced prostate cancer (pT3,4 N0, or pTxN1) in LRP group (P < 0.05) was probably resulted from the widespread use of PSA screening in Taiwan since LRP group patients were diagnosed in the earlier year than RaLRP group. However, in [Table 1], there was less cT3 disease in the LRP group (cT3, LRP vs. RaLRP, 12% vs. 33%). The reason for cancer upstaging after LRP might due to the multiparametric prostate MRI was not standardized for cancer staging 10 years ago. In several cases, the doctors used digital rectal examination and computed tomography scan for the clinical staging, which were not accurate for the precise cancer staging and might underestimate the staging of prostate cancer. The positive surgical margin rates were similar between RaLRP and LRP groups (51% and 49%). The previous systemic review showed positive surgical margin rates ranged from 12% to 53.3% in high-risk prostate cancer patients receiving RaLRP. Previous literatures showed that positive surgical margin rate was associated with higher pathological T stage.,,, Our study showed similar oncological outcomes compared with the cohorts in the previous literature. The BFS among RaLRP and LRP was 77.9% versus 80% at 12 months and 77.9% versus 78.8% at 18 months. Positive surgical margin was a significant independent predictor for biochemical BFS. Rogers et al. reported that BFS of 91% at 12 months and 86% at 36 months among patients >70 years with high-risk prostate cancer treated with RaLRP. The previous systemic review showed BFS among RaLRP group in high-risk patients ranged from 72% to 91%, which showed similar BFS outcomes compared with our study. The outcomes of our study were also comparable with those about open RP series for high-risk patients.,, According to previous literatures and our study, RaLRP can be considered among high-risk prostate cancer patients in Asia. In our hospital practice, we did not perform extended lymph node dissection (ELND) routinely; instead, we did standard lymph node dissection in most of the cases. Although EAU recommended to perform ELND for high-risk patients receiving RP, Sagalovich et al. reported higher complication or erectile function rates in patients with ELND. Furthermore, large randomized trials of extended versus limited LND have not been performed, and longer follow-up will be needed to determine the therapeutic benefits of ELND. High-risk patients were at risk of easy recurrence after definitive treatment, and there was growing evidence for multimodal treatment to achieve better long-term survival., In our hospital, there were about 4 (8%) patients in RaLRP group and 10 (12.5%) patients in LRP group receiving salvage radiotherapy (RT) combined with ADT. There was no adjuvant (immediate) RT for positive surgical margin patients; instead, we would do observation for the PSA trend first and then started salvage RT with/without ADT if the patients met criteria for biochemical recurrence. In most of the cases, we started salvage RT until PSA reached >0.4 ng/mL. There were debates about choosing adjuvant (immediate) RT or observation with salvage RT for patients with high risk of recurrence after prostatectomy. Although adjuvant RT for patients with aggressive pathologic characteristics after RP would reduce the risk of recurrence, these patients were associated with an increase in the 10-year cumulative risk of Grade 2 or more genitourinary and gastrointestinal toxicity. It was believed that observation followed by salvage RT was associated with fair cancer control in selected patients. There were some limitations in our study. First, the case number is relatively small, but it was the first study comparing outcomes between RaLRP and LRP in Asian countries. Second, the follow-up period is not long enough for long-term BFS or cancer-specific survival. Third, patients in RaLRP and LRP groups were operated by different surgeons, and the outcomes may be confounded by the different operators' learning curve. Although outcomes such as positive surgical margin and BFS did not differ between LRP and RaLRP groups, it was believed that learning curve of robotic surgery would improve oncological outcomes in the future. Fourth, follow-up time for RaLRP group was relatively shorter than LRP group because da Vinci robotic surgical system was not available until 2012 in our hospital. Further long-term follow-up of oncological outcomes between RALRP and LRP in high-risk prostate cancer patients is needed. This is the first study comparing the outcomes of high-risk prostate cancer between RaLRP and LRP in Taiwan. 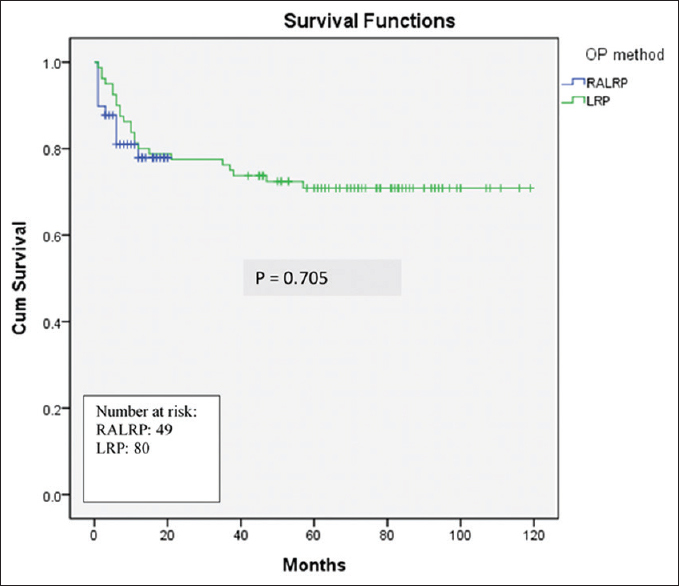 RaLRP was comparable with LRP with respect to pathological or oncological outcomes. Advanced T stage was associated with positive surgical margin. Positive surgical margin and higher iPSA level were independent prognostic factors for biochemical BFS. RaLRP can be considered among high-risk prostate cancer in Asian people. Ito K. Prostate cancer in Asian men. Nat Rev Urol 2014;11:197-212. Shao YH, Demissie K, Shih W, Mehta AR, Stein MN, Roberts CB, et al. Contemporary risk profile of prostate cancer in the United States. J Natl Cancer Inst 2009;101:1280-3. Ploussard G, Masson-Lecomte A, Beauval JB, Ouzzane A, Bonniol R, Buge F, et al. Radical prostatectomy for high-risk prostate cancer defined by preoperative criteria: Oncologic follow-up in national multicenter study in 813 patients and assessment of easy-to-use prognostic substratification. Urology 2011;78:607-13. Silberstein JL, Vickers AJ, Power NE, Fine SW, Scardino PT, Eastham JA, et al. Reverse stage shift at a tertiary care center: Escalating risk in men undergoing radical prostatectomy. Cancer 2011;117:4855-60. Cooperberg MR, Vickers AJ, Broering JM, Carroll PR. Comparative risk-adjusted mortality outcomes after primary surgery, radiotherapy, or androgen-deprivation therapy for localized prostate cancer. Cancer 2010;116:5226-34. Salomon L, Levrel O, de la Taille A, Anastasiadis AG, Saint F, Zaki S, et al. Radical prostatectomy by the retropubic, perineal and laparoscopic approach: 12 years of experience in one center. Eur Urol 2002;42:104-10. Bhayani SB, Pavlovich CP, Hsu TS, Sullivan W, Su Li. Prospective comparison of short-term convalescence: Laparoscopic radical prostatectomy versus open radical retropubic prostatectomy. Urology 2003;61:612-6. Engel JD, Kao WW, Williams SB, Hong YM. 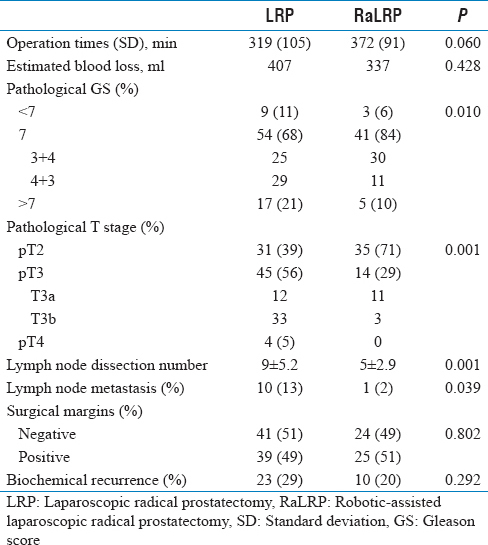 Oncologic outcome of robot-assisted laparoscopic prostatectomy in the high-risk setting. J Endourol 2010;24:1963-6. Jayram G, Decastro GJ, Large MC, Razmaria A, Zagaja GP, Shalhav AL, et al. Robotic radical prostatectomy in patients with high-risk disease: A review of short-term outcomes from a high-volume center. J Endourol 2011;25:455-7. Lavery HJ, Nabizada-Pace F, Carlucci JR, Brajtbord JS, Samadi DB. Nerve-sparing robotic prostatectomy in preoperatively high-risk patients is safe and efficacious. Urol Oncol 2012;30:26-32. Spahn M, Weiss C, Bader P, Ströbel P, Gerharz EW, Kneitz B, et al. Long-term outcome of patients with high-risk prostate cancer following radical prostatectomy and stage-dependent adjuvant androgen deprivation. Urol Int 2010;84:164-73. Shikanov SA, Thong A, Gofrit ON, Zagaja GP, Steinberg GD, Shalhav AL, et al. Robotic laparoscopic radical prostatectomy for biopsy Gleason 8 to 10: Prediction of favorable pathologic outcome with preoperative parameters. J Endourol 2008;22:1477-81. Punnen S, Meng MV, Cooperberg MR, Greene KL, Cowan JE, Carroll PR, et al. How does robot-assisted radical prostatectomy (RARP) compare with open surgery in men with high-risk prostate cancer? BJU Int 2013;112:E314-20. Pierorazio PM, Mullins JK, Eifler JB, Voth K, Hyams ES, Han M, et al. Contemporaneous comparison of open vs minimally-invasive radical prostatectomy for high-risk prostate cancer. BJU Int 2013;112:751-7. Yuh B, Artibani W, Heidenreich A, Kimm S, Menon M, Novara G, et al. The role of robot-assisted radical prostatectomy and pelvic lymph node dissection in the management of high-risk prostate cancer: A systematic review. Eur Urol 2014;65:918-27. Rogers CG, Sammon JD, Sukumar S, Diaz M, Peabody J, Menon M, et al. Robot assisted radical prostatectomy for elderly patients with high risk prostate cancer. Urol Oncol 2013;31:193-7. Walz J, Joniau S, Chun FK, Isbarn H, Jeldres C, Yossepowitch O, et al. Pathological results and rates of treatment failure in high-risk prostate cancer patients after radical prostatectomy. BJU Int 2011;107:765-70. Loeb S, Schaeffer EM, Trock BJ, Epstein JI, Humphreys EB, Walsh PC, et al. What are the outcomes of radical prostatectomy for high-risk prostate cancer? Urology 2010;76:710-4. Sagalovich D, Calaway A, Srivastava A, Sooriakumaran P, Tewari AK. Assessment of required nodal yield in a high risk cohort undergoing extended pelvic lymphadenectomy in robotic-assisted radical prostatectomy and its impact on functional outcomes. BJU Int 2013;111:85-94. Gandaglia G, Briganti A, Clarke N, Karnes RJ, Graefen M, Ost P, et al. 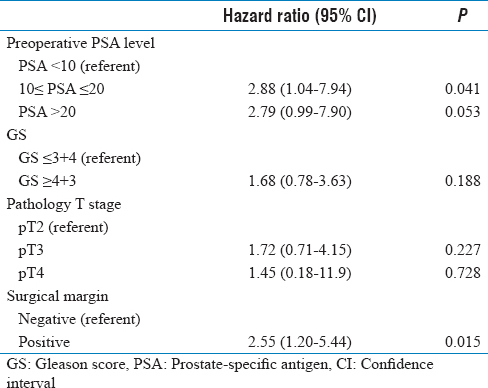 Adjuvant and salvage radiotherapy after radical prostatectomy in prostate cancer patients. Eur Urol 2017;72:689-709.